For more than 160 years Catholic schools have enriched communities through the education of students rooted in the gospel of Jesus Christ. Looking towards the future, the Catholic community is asked to think about and to discuss the essence, value and importance of Catholic schools. A province-wide discussion is taking place that will provide a forum for a discussion about our schools and their future. This initiative is part of an awareness and engagement strategy undertaken by Ontario’s Catholic education partners–Ontario Conference of Catholic Bishops, Ontario Catholic School Trustees’ Association, Ontario English Catholic Teachers’ Association, The Catholic Principals’ Council of Ontario, Ontario Catholic Supervisory Officers’ Association, Ontario Catholic School Business Officials’ Association, and the Ontario Association of Parents in Catholic Education–under the auspices of the Institute for Catholic Education. An “Our Catholic Schools” Discussion Kit has been prepared and distributed to all OCSTA members boards. Boards will be sharing these kits with their school councils, teachers, students, parents, staff, parish groups and other interested community members. If you would like to participate in a discussion group within your Catholic school community, please download the documents below. 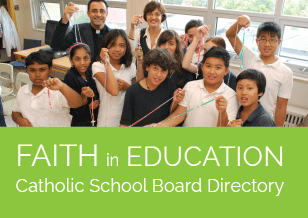 General information about the format and objectives are contained in the “Our Catholic Schools Brochure” (see downloadable file below) or you may call the Ontario Catholic School Trustees’ Association for more information, (416) 932-9460. Please remember that all responses generated during the group discussion and recorded on the Our Catholic Schools Group Report or Individual Report forms must be returned to your local school board. This is an important opportunity for all of us to make our views about our Catholic schools known. The ideas and opinions we contribute will be shared with the local Catholic school board and the Institute for Catholic education. Please be a participant in the future of Catholic education!